Post Cards From the Past: Pre-Columbian Visitors to Chichen Itza? Pre-Columbian Visitors to Chichen Itza? Chichen Itza was a late classic and post classic city, ( no, it is not a fast food franchise) which means that it it flourished after most of the Mayan civilization, had started to crumble. The Toltec tribe moved down from Mexico in about the year 1000 AD and took it over. They may have been pushed out by Aztecs, but they gave the city a second life and a Toltec makeover.The ruins are as impressive as any I have ever seen in the world. The step pyramid, El Castillo, rivals the grandeur of the great pyramids in Egypt. The ball court is the size of an NFL football field. There is even a building archaeologists think was an astronomical observatory, not bad for a civilization that had not yet found its way out of the Stone Age. That is right, these Mayan/ Toltecs were just beginning to work with soft metals like gold and silver. They did not even have copper or bronze implements. Iron was lightyears away from discovery. One of the great enigmas is that they had written language, books, sophisticated calendars, advanced agriculture, and highly developed engineering skills, but they never thought about putting wheels on a cart to pull things around. I will get back to Chichen Itza in future blogs but today I want to focus on one engraving that I had photographed a few years ago and recently rediscovered. On the wall inside one of the temples, an image was etched into the wall that our guide claimed was a Pre-Columbian drawing of a ocean going ship. Much has been made that when Cortez arrived in Mexico, the Aztecs took him to be Quetzalcoatl, the famed white god that helped create the world and gave these people, books, agriculture, calendars, etc. Since my visit, it has been shown that the idea of Native Americans thinking Cortez was a god came mainly from Cortez. After all Pocahontas and Squanto were not fooled a minute. Never the less, Quetzalcoatl was widely worshipped by Aztecs, Mayans and Toltecs . The legend has it that after doing all these wondrous things, he made a raft of snakes and sailed off into the East promising to return. Our guide proudly pointed to the carving on the wall inside the dark temple and said, “See!” I flashed a quick picture out of pity, so he would not feel bad, but frankly I did not see it. I remember the guide's name, Caesar. Caesar went on to say that it was an image of an ocean sailing vessel carved into the wall hundreds of years before Columbus, Cortez, or Montejo were in the Americas. Montejo was the conquistador who ravaged the area around Chichen Itza. A few weeks a ago, I came across the photo. For some crazy reason I took the photo and scanned it into Photoshop, bumping up the contrast and then connecting the dots and tracing over the lines. My mouth went agape when I viewed the result. To me, it looks like a European or Mediterranean sailing vessel. What do you think? 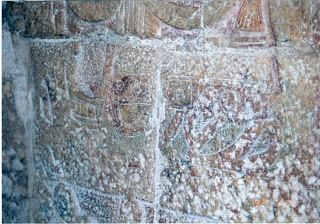 The thing is that the style and look of the image was identical to all the other images in the temple that were know to be Pre-Columbian. Could it have been carved after Cortez arrived? Perhaps. The site was still in use, though decaying, when the Spanish arrived in Mexico. In 1524 AD. Cortez stopped in Cozumel, but bypassed the Yucatán Peninsula where Chichen Itza is located. Toltecs fought their last civil war in about 1480 AD and had pretty much stamped out the last vestiges of Mayan/Toltec civilization by that time.. Still, Native Americans lived around the city when Montejo invaded in about 1697. He used the ruins for protection while the locals attacked him and initially drove him out. 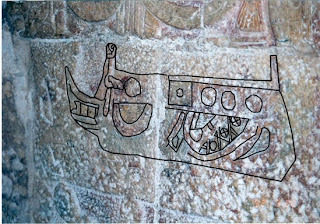 I would like to think that the carving is an image of a vessel from Europe or some Mediterranean source and that the Americas were visited by many people from across the Atlantic, Vikings, Welshman, Irishmen, and Phoenicians to name a few. Columbus was just the first to do it up “right” and provide proper documentation. 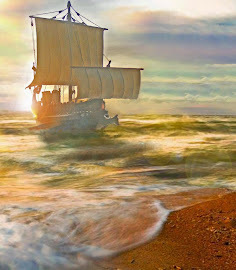 People have been sailing from the Mediterranean to Britain in very sophisticated sailing ships for over 3000 years. Is it so hard to believe that from time to time an adventurous soul did not sail off into the West or was blown off course to the new world long before Columbus?